Refined and welcoming, all rooms and suites at Carlo Magno Hotel Spa Resort are furnished with elegance and flair and are equipped with the most modern comforts, to help you truly enjoy a unique vacation in the midst of the marvellous natural wonders that are the Brenta Dolomites. Also awaiting you are comfortable apartments designed to host guests who want to experience a vacation in complete freedom. Comfortable double room with bathroom, shower , hair dryer telephone, sat TV, in-room safe. 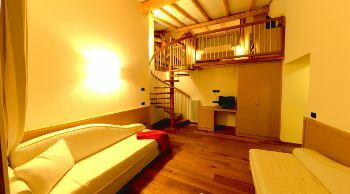 Comfortable double room with bathroom, shower , hair dryer telephone, sat TV, in-room safe, most with view of the Dolomites and balcony. Stylish double room with bathroom, tub/shower , hair dryer telephone, sat TV, in-room safe, most with view of the Dolomites and balcony. To celebrate the long history of our hotel (more than 100 years old) we decided to renew 3 special rooms by restoring the beautiful wooden roof, its stone wals and by encreasing their comfort. We did this renewal by followong the phylosophy of our house: the materials and the hart must be joined with the well beeing of those who enjoy them. Elegant junior suite with living room, walk-in closet, bathroom, tub and shower , separate toilet, hair dryer, telephone, sat TV, internet ADSL connection, in-room safe, balcony with view of the Dolomites. 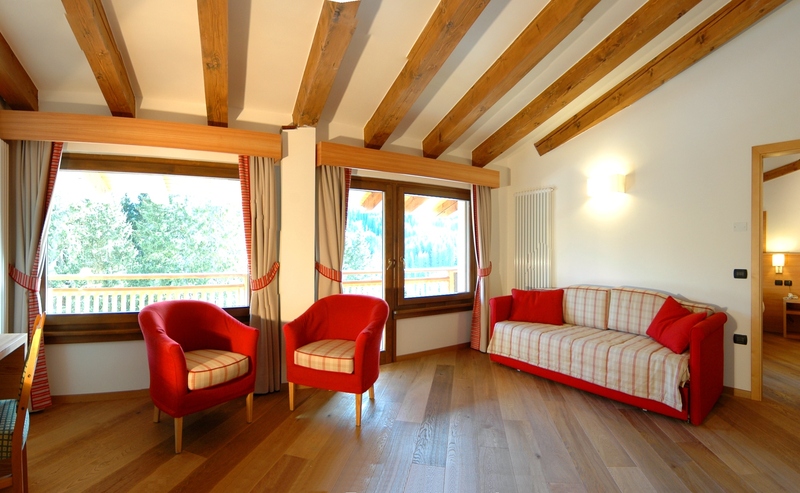 Luxurious suite on two levels with large living room, two bathrooms, one with tub and toilet separated, the other with shower, hair dryer, telephone, sat TV, internet ADSL connection, in-room safe, balcony with view of the Dolomites. Luxury room with large living room, two sleeping rooms, and two bathrooms: shower, wirpool, phoon, telephone, sat TV, internet ADSL connection, in-room safe, balcony with view of the Dolomites.